Early in the morning, usually before dawn and nearly always before sunrise, the wombat approaches the burrow where it intends to spend the day. Pausing a few metres from the entrance, the wombat rubs its flank against the rough bark of a tree (Figure 4.1), scratches itself once or twice, shakes itself vigorously if its fur is wet, and then moves closer to the burrow. Sometimes as it moves into the entrance tunnel it may leave a few drops of fluid in its path. 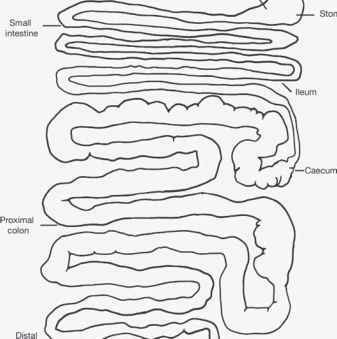 This is a form of scent trail, and I will say more about it in another chapter. 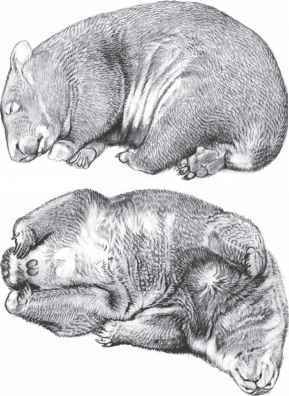 Figure 4.2 One of the sleeping positions adopted by the wombat (top). For much of the day the wombat sleeps on its back (bottom). Illustrations: © Peter Schouten the ground beside it a few backward scratches with a forepaw before sighing deeply as it settles to sleep, either curled up in a ball or stretched out on its side (Figure 4.2). After an hour or so it changes its sleeping position; it may roll right over on to the other side - a movement it makes quickly and without raising its body off the ground at all, but rolling more in the fashion of a fat cylinder - or it may roll over on to its back. In this last position, which is probably the most relaxed attitude a sleeping animal can adopt, the front legs are loosely bent at the wrist and the back legs stretched out. The head is usually tilted right back, chin in the air, or sometimes turned to one side. Only an animal that is well protected on account of its subterranean way of life and has few natural enemies can sleep in such a very relaxed and vulnerable attitude. Figure 4.3 Dozing near the entrance before emerging, the wombat lies prone. Figure 4.4 In the prone position, the hind feet are sometimes tucked under the small tail. more often and for longer periods on warmer days than in colder weather, probably because the sparser fur on its chest and abdomen allows some heat to be lost from the skin. While it sleeps the wombat also sometimes grinds its teeth, snores, yawns, sighs, scratches, snorts to clear its nose of dust, and produces long sonorous rumbles from various parts of its anatomy. It is probably just as well that it usually sleeps alone! Through the day the wombat often scratches itself to remove dust or dirt particles from the skin. It is also plagued by a number of external parasites, such as ticks and fleas, and by various kinds of blood-sucking insects (mosquitoes and certain flies) that frequently inhabit the burrow. The wombat usually spends the greater part of the day deep in the burrow, but in the late afternoon it moves slowly along the tunnel to within a metre or so of the entrance, where it crumples on to its stomach, the front paws tucked in under the chin and the body spread out so thinly that it looks as though it has been rolled out (Figure 4.3). 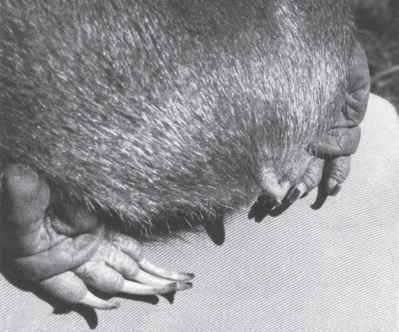 The back legs are either stretched out behind or bent right under the wombat's lower body, the back feet turned sideways and forming a kind of shelf under the small tail (Figure 4.4). The wombat dozes near the entrance until it is ready to leave the burrow.